a At 293 K and 1.01 x 105Pa unless otherwise indicated. b A particular form of olivine, (Mg, Fe)2SiO4. c A particular form of pyroxene, (Ca, Fe, Mg)2Si2O6. d X can be a molecule of a variety of rocky minerals, and n is greater than or equal to one. e As a gas. f As a gas, at 273 K.
For example, suppose that we are building a model of the Earth on the basis of its mean density. In spite of their abundance we can rule out the two lightest elements hydrogen and helium as important constituents - the Earth is far too dense to contain much of these intrinsically low-density substances. But when it comes to choosing between iron-nickel (7925 kg m-3) and zinc (7140 kg m-3) for the dominant constituent of a dense central core, density alone is a poor guide - both substances are denser than the mean density of the Earth. There are many grounds for choosing iron, but among them is the relative abundances of the elements in the Solar System - iron is about 1000 times more abundant than zinc. Of course, most elements will be present as compounds, and of particular importance are abundant rocky materials, notably silicates, and abundant icy materials, notably water. □ Do silicates and water include abundant elements? Silicates are based on the abundant elements oxygen and silicon (Section 2.2.2), and water (H2O) is a compound of oxygen with the most abundant element of all, hydrogen. Rocky materials are intrinsically denser than icy materials, and icy materials are intrinsically denser than hydrogen and helium. Chemical affinities are also important. These express the tendency for certain elements to occur together. Elements can be grouped on the basis of these affinities, and three groups of particular relevance to planetary interiors are the siderophiles, chalcophiles, and lithophiles. The siderophiles ('iron-lovers') comprise iron, and various metallic elements that tend to be present with metallic iron, such as nickel. The chalcophiles tend to form compounds with sulphur. Zinc is one example. The lithophiles ('rock-lovers') tend to be found in silicates and oxides - magnesium and aluminium are important examples. Iron is so abundant that it occurs in sulphides, oxides, and silicates, as well as in elemental form. To illustrate how chemical affinities can be used, consider a planetary body with a surface that is heavily depleted in iron. It can then be argued that iron has been concentrated into the interior, perhaps into a central core of metallic iron. Support for this possibility would be a surface depletion in the siderophilic element nickel, and an enrichment in the lithophilic element aluminium. 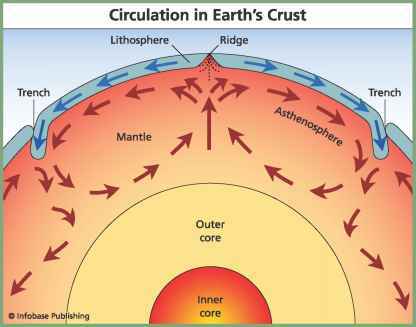 In deciding whether a substance could be a significant component at some depth in the interior of a planetary body, we need to know its density at the pressure and temperature at that depth. The equilibrium relationship between the density of a substance and its pressure and temperature is known as the equation of state of the substance. This equation not only allows us to calculate the density at some depth, but also enables our models to achieve consistency. Thus, if we specify a substance at a certain depth, we are only free to specify two of density, pressure, and temperature - the equation of state determines the third. For the great majority of plausible substances for the interiors of most planetary bodies, pressure is far more important than temperature as a determinant of density. Though the temperatures at all but shallow depths in the interior are far higher than at the surface, the thermal expansion of rocky (and icy) materials is slight, resulting in only a slight decrease in density compared with that at the surface. By contrast, the pressures at such depths squeeze the materials so much that their densities increase far more than that required to offset the thermal expansion. So, to a first approximation we can ignore temperature and concentrate on pressure. To find the pressures in the interior we use the fact that if a body is neither contracting nor expanding then the pressure at any radius must be just right to support the overlying weight. Consider a thin spherical shell of material of inner radius r and thickness Sr, where Sr is small compared with r, as in Figure 4.10. To a first approximation we can assume that the planetary body is close enough to spherical symmetry so that we can regard its density as varying only with radius. In this case it is remarkable but true that the mass above the shell exerts zero net gravitational force at all points in the shell. The net gravitational force on the shell due to the rest of the body is thus the gravitational force exerted on it by the inner sphere of radius r. The net force is thus downwards, towards the centre. There is also a downward force on the shell due to the pressure at r + Sr, and an upward force due to the pressure at r. In equilibrium the total downward force must equal the upward force, and so the pressure at r must exceed that at r + Sr. It follows that pressure increases with depth at all values of r. This is an important general result. The magnitude of the gravitational force on the shell is obtained from Newton's law of gravity, equation (1.5). 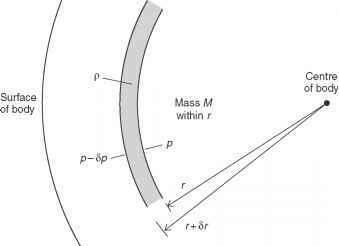 □ For a spherically symmetrical body of radius r, where can all of its mass be regarded as concentrated when calculating the gravitational force it exerts? Figure 4.10 The balance of forces on a spherical shell in a planetary interior.